Rajya Sabha presiding officer is known by the designation of the Chairman of Rajya Sabha. Vice President of India is the ex-officio Chairman of the Rajya Sabha. When the President of India is unable to perform its duties, the Vice President of India performs the duties of the President. The Chairman of Rajya Sabha can be removed only when the Vice-President of India is removed, the process of which I have already discussed in the Vice President lecture. Salaries and allowances of the Vice President of India are charged on the Consolidated Fund of India. Whenever the Vice President acts as the President, he is given the allowances of the President and not the Vice President. When the resolution for the removal of Vice President is under consideration he can not preside over the proceedings of the Rajya Sabha, though he can be present and take part in the proceedings without voting power. Chairman while presiding over Rajya Sabha has the power of a casting vote in the event of a tie. 1. Speaker has the power to certify whether a particular bill is money bill or not. 2. Speaker has the power to vote in the first instance when a removal motion has been initiated against him, whereas this privilege is not available to the Chairman of the Rajya Sabha. 3. Speaker of the Lok Sabha presides over the Joint sitting of the Lok Sabha and the Rajya Sabha which is being called in by the President. 4. Speaker of the Lok Sabha is the member of the Lok Sabha, whereas the Chairman of the Rajya Sabha is not the member of the Rajya Sabha. # Looks are the duties of the Chairman when the Chairman is not present for some reasons. 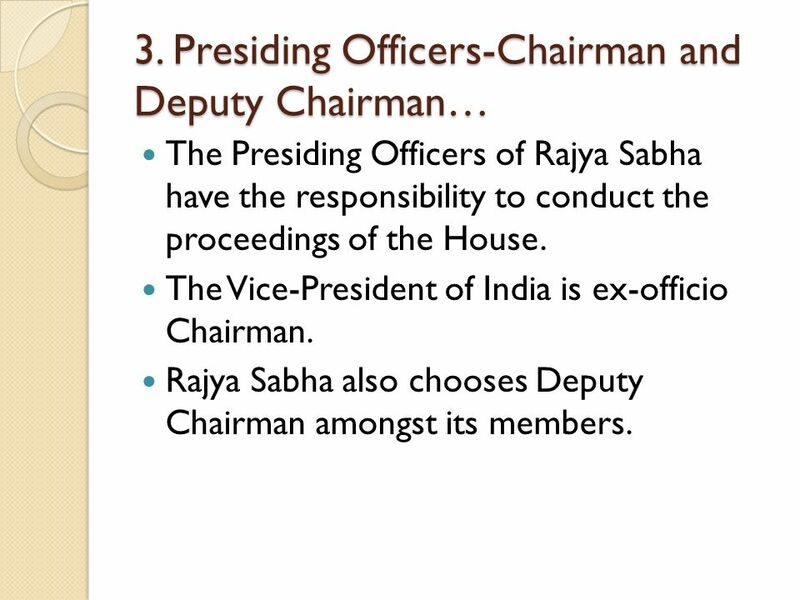 # Deputy Chairman is not subordinate to the Chairman of Rajya Sabha and is directly responsible to the House. 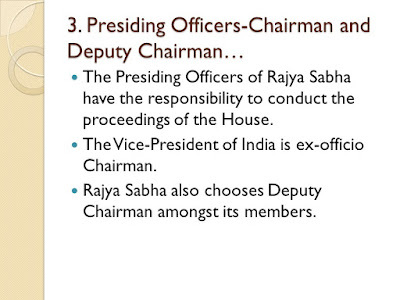 # Deputy Chairman is elected by the members of the Rajya Sabha from amongst themselves. # Salaries and allowances are decided by the Parliament and are charged upon the Consolidated Fund of India. # For leaving his post, he has to address his resignation to the Chairman of the Rajya Sabha. # For removing the Deputy Chairman, a resolution supported by an absolute majority of the Rajya Sabha is required.